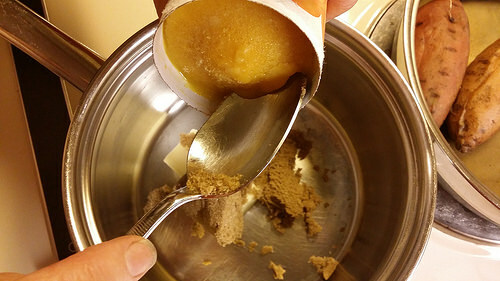 ½ cup Dark Brown SugarFor a more tart version, use a few tablespoons less. 1 Early in the day I usually cook the yams. 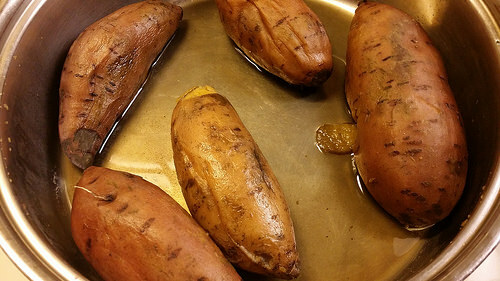 I just wash them well, place them in a large pot, and fill it with water just until the water about covers the yams. 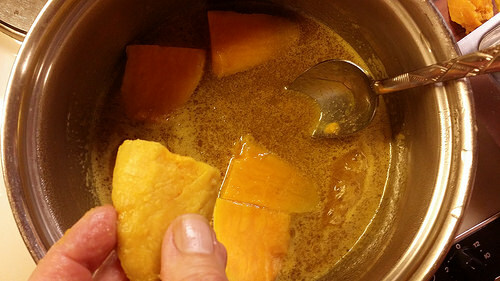 Then I cook the yams and water at a simmer until the water has evaporated. 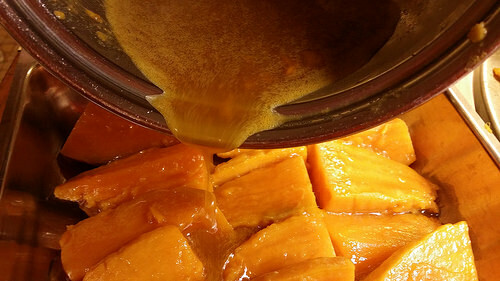 That way, the taste of the yams stays in the yams rather than goes down the drain. 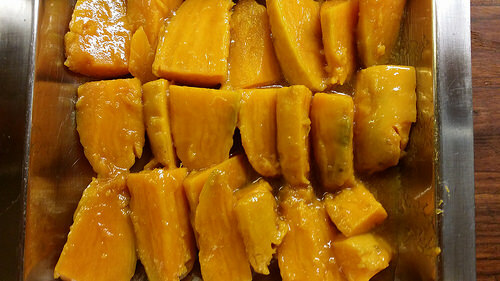 The yams should be quite soft; this seems to enhance their ability to absorb the sauce. Let the yams cool. I leave them as long as until the evening if that is when I can get back to finishing this dish. 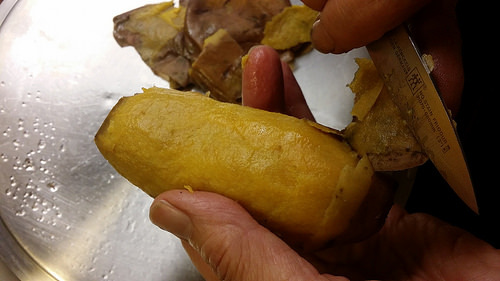 2 Peel the skin off the yams. This is very easy to do. 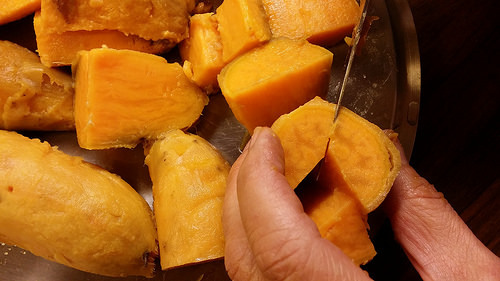 3 Then cut the yams into chunks that are about two inches by two inches or so. Set them aside. 4 In a medium sauce pan, cook together the butter, orange juice, and brown sugar. Let them boil together about two minutes. 5 Have on hand the serving dish in which you wish to serve the yams. One-by-one, dip the yam pieces into the sauce as it continues to cook, just coating each piece. Place the pieces in the serving dish right up close to each other. 6 After that is done, pour the remaining sauce over the yams. 7 Let the dish cool. Cover it with plastic wrap and refrigerate. I almost always prepare this dish to this point on the Monday before Thanksgiving. 8 Sometime Thanksgiving morning, you can take the dish out of the refrigerator. 9 Preheat the oven to about 350 degrees. 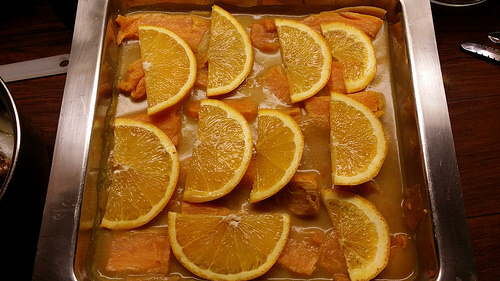 Just before baking the dish, place thin slices of orange over the yams. Bake for about 25 minutes, or until the sauce is bubbly. 10 This is a wonderful dish. It makes a wonderful leftover as the flavor intensifies. 11 I have used these to make a sweet potato pie, and have even used the sauce over vanilla ice cream.